A dusty town tucked into the volcanic valleys northwest of Guadalajara, Tequila is the birthplace of the eponymous drink and has been producing Mexico’s national beverage since the 16th century. A UNESCO World Heritage Site, the town is surrounded by Jalisco’s blue-agave plantations, which produce some 50 million gallons of the spirit each year. 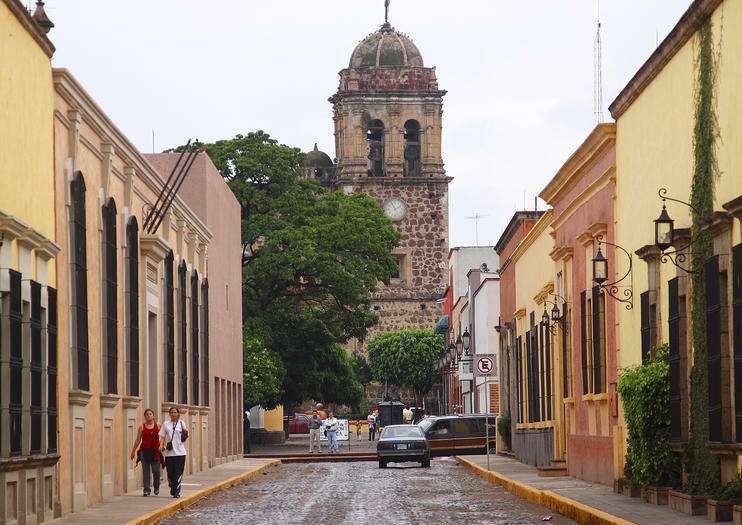 Of course, visitors to the town come for the tequila, many following the popular Jalisco Tequila Trail to the region’s distilleries or hitching a ride on the scenic Tequila Express train. The town’s main attraction is the Jose Cuervo Distillery, the world’s oldest and largest tequila distillery. Nearby Casa Herradura, La Rojeña (another Cuervo distillery), and Los Abuelos distilleries are also popular stops, where visitors can tour the production plants and indulge in a selection of top tequilas. Tequila tours typically run from nearby Guadalajara, often including a stop at the National Tequila Museum, a guided distillery tour, and a tequila tasting, where you’ll discover the difference between tequila blanco (white or silver tequila), tequila reposado (‘rested’ tequila), and tequila añejo (aged tequila). Visiting on a tour or with a private driver is recommended, especially if you plan on sampling the tequila. Bring sunscreen, a hat, and comfortable shoes for walking around the agave plantations and distilleries. The legal minimum drinking age in Mexico is 18 years old. Tequila is located in the state of Jalisco in western Mexico, about 40 miles (65 kilometers) west of Guadalajara, or just over an hour’s drive. Buses run from the Vallarta Zapopan Terminal in Guadalajara, but a far more scenic route is to catch the José Cuervo Tequila Express. Tequila trains run only on weekends throughout the year, and although this is the busiest time to visit, it’s worth it for the festive atmosphere. Weekday visits are quieter, making it a good time for a private distillery tour or a more intimate tequila tasting, but be aware that the Tequila Museum is closed on Mondays. The liveliest time to visit Tequila is during the annual Festival del Tequila, held in Guadalajara in March, or the National Tequila Fair in late November or early December. One of the most popular ways to experience Mexico’s Tequila Trail is a ride on the Tequila Express, and the historical railway is an experience in itself. Two different routes set out from Guadalajara, to Amatitán or Tequila, traveling through scenic landscapes of blue-agave plantations against a backdrop of volcanic peaks. Onboard, guests can sip tequila cocktails, listen to the entertaining commentary, and enjoy traditional mariachi music. Trains stop at Casa Herradura Distillery or the Jose Cuervo La Rojeña Distillery, where tours, tequila tastings, and a typical Mexican lunch are all included in the ticket price. Oplev det lækre landskab i Mexicos berømte tequila-producerende region på en hel dags tequila tur til Jalisco. Besøg en af ​​verdens mest berømte tequila destillerier til at tur og smag dig rundt i dette ikoniske etablissement. Udforsk historiske agavefelter under din rejse fra Guadalajara og få kendskab til den komplekse gæringsproces, der er integreret i fremstilling af lækre tequila. Nyd den brændende smag af Mexicos nationale drikke, mens din guide tilbyder kyndig fortælling. En nær oplevelse er garanteret på denne lille gruppe tur, med tal begrænset til 13 personer.